So you think you're tough? You think you can handle a little bit of super action? 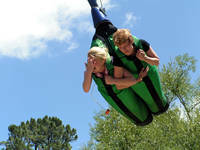 Well head on over to Rotorua in New Zealand and check out the Agrodome Adventure Park. Located next to the Agrodome, the adventure park is a place to get adrenalin spikes while jetboating, zorbing, bungy jumping or swooping - or a lot of laughs watching your friends trying to be brave while scaring themselves out of their wits! For a bit of warm-up action we can recommend the jetboating - where you are raced in the Agrojet around a winding, man-made course at over 100kmh (acceleration is from zero to 100km/h in 4.5 seconds) sending clouds of spray all over the place. 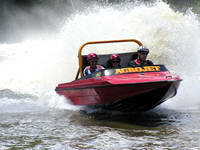 Everyone who tried the jetboat, which is said to be New Zealand's fastest, said it was a great buzz and it certainly looked a bit easier than what was to follow - bungy and the swoop (I shudder as I remember looking at this one). For the 40-metre+ bungy you go up a hydraulic tower and throw yourself off while attached to elasticy ropes that hopefully won't break (or aren't too long) (or have been tied on properly). It's in a very picturesque spot so if the previously mentioned things occur at least you'll have some good thoughts as you piledrive into the ground! Next was the Swoop and I have to say that the folk who tried it while we were there would have to have been certifiable. The Swoop has you and a friend strapped into sleeping-bag-like arrangements and then you are raised to terrifying heights on the tower. There you are - bazillions of metres in the air and then … you have to hit a switch that drops you and allows you to swoop gracefully towards the ground at an estimated 130kmh. When we say gracefully it is sort of like: Click. "Aaaaaaaaaaaaaaaaaaaaaaaa" Swoooooosh. "Oh my God" Swoooooosh. "Aaaaaaaaaaaaaaaaaaaaaaaaa". You get the picture, but if you don't check out the image on the right. The Swoop is for the brave, or stupid. Doesn't matter which. Near that arena of terror is a large building that is pretty much one giant wind generator. 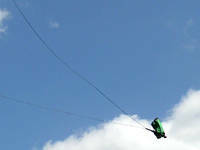 It is the place you can practise (or try your hand at) parachuting and is called Freefall Extreme. This is a ripper activity, but it is not easy. You get into a jump suit, take off all your moveable objects, get a quick lesson on how to skydive and then it's off outside on to the top of the wind tunnel. You stand on netting - and there is netting above you so you don't fly off into space - and then they crank up the power. The howling of the wind is phenomenal and it takes quite a bit of concentration to begin to fly. There are a couple of guys there at all times to make sure you are okay and to give you some tips. In my two-minute session, which seemed one heck of a lot longer, I flew a few times, got thrown off a few times and got dumped a couple of beauties. Rating - super fun! But not as easy as you think. Last of all at the Agrodome's Adventure Park is Zorbing - a unique New Zealand activity where you hop inside a giant rubber ball and bowl yourself off down a hill for a tumble ride. You can be strapped in, which apparently is being phased out because it is pretty hard going, or you can get a wet ride where they slosh in a couple of buckets of water and you can get soaked while on the way down. 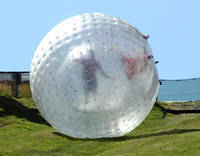 Zorbing is excellent for most ages and the crew at Zorb Rotorua are excellent. In fact all the people connected with the park were terrific and more than willing to assist and make sure you have the time of your life.